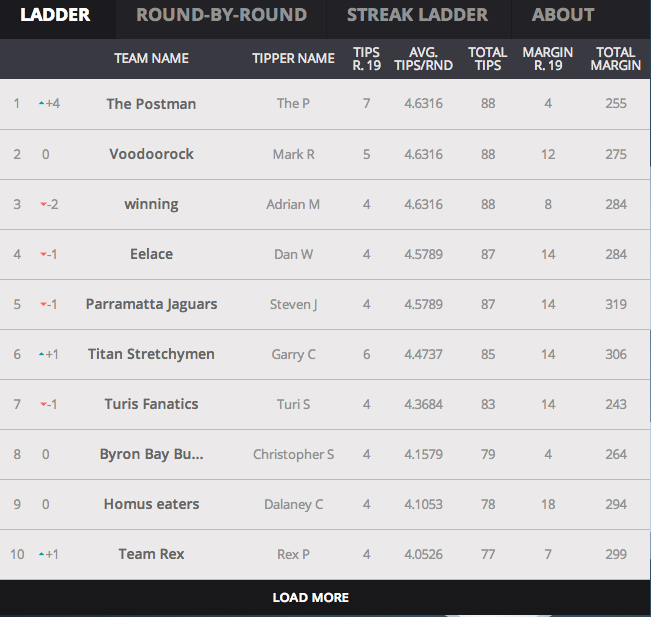 Only a week after going top of the NOT The Footy Show Tipping Comp table... we squeezed out a 2/8 week and really it should have been 3/8... as the 'I hate changing my tip' rationale cost us badly in the Warriors-Manly game... suffice to say - no longer top of that comp. Tips below - good luck with your run home but be aware - if you are going to make a move it needs to be NOW... chasing tips in the final 2 or 3 weeks never works. The Postman's Late Mail is now - sadly - officially finished for 2014... it's out of my control honestly, but better to be safe than sorry everyone. That's as much as I can say. And yes - the NRL Tweet Player of the Year Voting Leaderboard is now up to date through Round 19 - the last public update until the end of Round 26. |-| Bulldogs v Panthers - Bulldogs by 6 points. |-| Sea Eagles v Broncos - Sea Eagles by 6 points. Foran doesn't play and I waver... hate tipping against any Sea Eagles side with DCE+Foran in it... did it last week and got burnt. |-| Sharks v Eels - Eels by 10 points. Sharks dudded my 'Panthers are specials' theory last week... but surely Parra are 'specials' this week with Hayne in such good form? |-| Cowboys v Titans - Cowboys by 10 points. JT leads the Cowboys further up the ladder here. |-| Roosters v Dragons - Roosters by 12 points. Chooks start to click... I think. |-| Raiders v Warriors - Warriors by 6 points. Canberra need changes - they may come by kickoff - but even with no Shaun Johnson - I rate Tuimoala Lolohea highly so Warriors to win. |-| Rabbitohs v Knights - Rabbitohs by 6 points. No gimme for the Bunnies... but I can't tip the Knights after their last two weeks. Even if Sam Burgess joins John Sutton on the sidelines. |-| Tigers v Storm - Storm by 4 points. Robbie Farah needs to play for the Tigers to keep this under 12 points... they can also win the game but I'm sticking with the Storm after abandoning them last week curiously. Manly are the benchmark - followed by a host of pretenders after Round 20. No that isn't one of the 10 things I'm 'revealing' in a long overdue feature piece here on www.wdnicolson.com but it bears repeating the fairly obvious because they simply play a better brand of footy than EVERYONE else in the competition. The Chooks are quite rightly the defending Premiers but Manly have been the best team this season... though when you look at how inconsistency has plagued nearly every team from 2nd to 13th - is that a really defining statement about Manly or the rest of the competition? Warning... below is nearly 2,000 words... interesting reading hopefully but nevertheless you've been warned, there's a few words below... so get a coffee or a tea and settle in. The new season is entering the final 7 Rounds and The @NRLTweet Player of the Year Awards are getting very interesting. After 19 Rounds the current Leaderboard is revealed for the last time but real-time weekly Voting will remain available on Twitter. How do you think the Dally Ms will stack up in comparison? Okay... so we've just worked out that we're tipping semi decently this season after all! Sure we're not in Top 1% territory but somehow despite a less than stellar tipping percentage (61%-ish) - we're going okay (around 2,200th overall and good enough for equal 1st in the NOT The Footy Show Tipping Comp below)... so hopefully you are too. 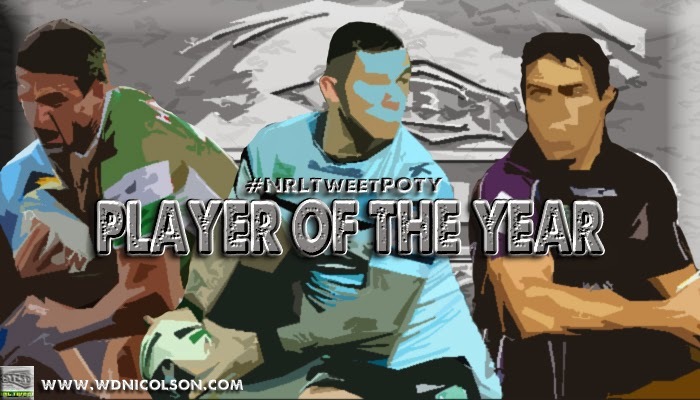 And yes - the NRL Tweet Player of the Year Voting Leaderboard is now up to date through Round 19. |-| Broncos v Storm - Broncos by 2 points. Ripping contest... Broncos must defend better than they did last week but Melbourne also will want a statement like win... last week v Canberra wasn't, this week could be - but I'm going Broncos with Barba on his way out of 1st grade if he turns it up again this week. |-| Knights v Roosters - Roosters by 10 points. Gidley's shift to the halves had refocused Newcastle... but he was lame with a abdominal strain against the Titans and was out of the game by halftime... which coincidently so were Newcastle. Roosters by as many as they wish I fear. |-| Panthers v Sharks - Panthers by 12 points. Penrith could tear Cronulla a new one in Bathurst... yep, I just don't like the Sharkies at all in this one - it reeks of one of those games a team plays in who are counting down the days til the end of the year... I know that sounds harsh but Ivan Cleary made big changes up front so Penrith are going to rip in this week - and they can play in September, Cronulla cannot. |-| Titans v Eels - Eels by 4 points. |-| Bulldogs v Cowboys - Bulldogs by 4 points. Canterbury's pack v JT... in Cowboyland I might go with JT - but not this week even with Reynolds still out. |-| Warriors v Sea Eagles - Warriors by 2 points. Going with the upset - Manly are the 'smart' tip but the Warriors can well and truly make a game of this up front and if Shaun Johnson plays interested - who knows? The Warriors might win by 20! |-| Tigers v Dragons - Tigers by 4 points. Farah and Woods v Creagh and Marshall - I likey this contest... but I likey the Tigers if they play anything like the kind of football they did last week against Canterbury. |-| Raiders v Rabbitohs - Rabbitohs by 8 points.